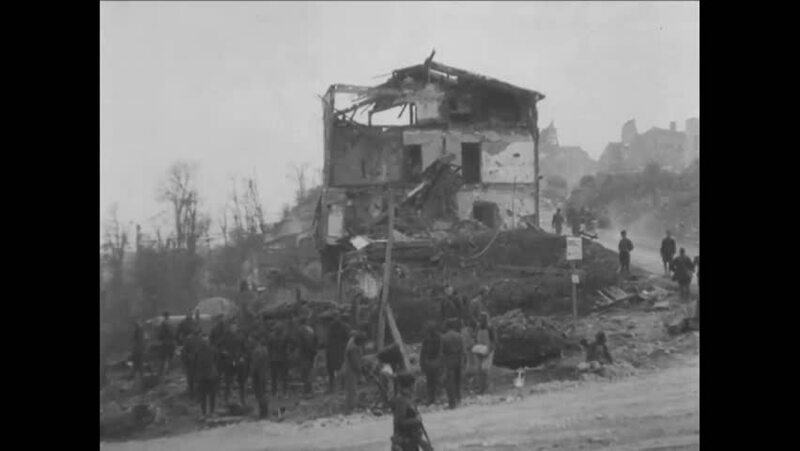 hd01:09CIRCA 1918 - A panoramic view shows the ruins of a war-torn town near Chemin des Dames. hd01:06CIRCA 1940s - A truck drives from a farmhouse to the airfield, and Memphis Belle crew are decorated with Distinguished Flying Crosses. 4k00:211920s: Mountains. Car drives down winding road. Train moves through town. hd01:17CIRCA 1920s - Performance of Fryske sounds, a symbolic game written by YC Schuitmaker to mark the 400th anniversary of Sneek, Netherlands. hd00:50CIRCA 1918 - US soldiers prepare to fire a canon in the Saint-Mihiel offensive. hd01:08CIRCA 1941 - Russians burn their valuable farmland and factories so that the Nazis cannot take advantage of such resources. sd02:21CIRCA 1940s - Battlefield in the 1940s, soldiers operate cannons and fight for survival, many of them are injured.